This is an excellent side dish for any kind of grilled or roasted meat, or any Mediterranean inspired meal. It could even be the base of a delicious grain bowl with some chickpeas and tzatziki or hummus and roasted vegetables. Heat a medium pot over medium-high heat until hot. Add the Einka & Lentil blend and 1 ½ tsp. cumin seeds and toast over medium-high heat for about 3 minutes, until it begins to pop and smell toasty. Add 2 Cups water and a pinch of salt and bring to a boil. Then lower the heat to simmer, cover and cook for 25 minutes, until done. Drain off any excess water. While Einka & Lentils are cooking, prepare the onions: Heat a large frying pan over medium-high heat until hot. Add ¼ Cup olive oil and let it warm for about 30 seconds. Add the sliced onion and ½ tsp. kosher salt. Cook, stirring every couple of minutes until the onions are deeply browned and blackened in spots, about 15 minutes. In the last minute of cooking, add ½ tsp each: cinnamon, cumin, and turmeric. Cook, stirring for about a minute, then remove from the heat. 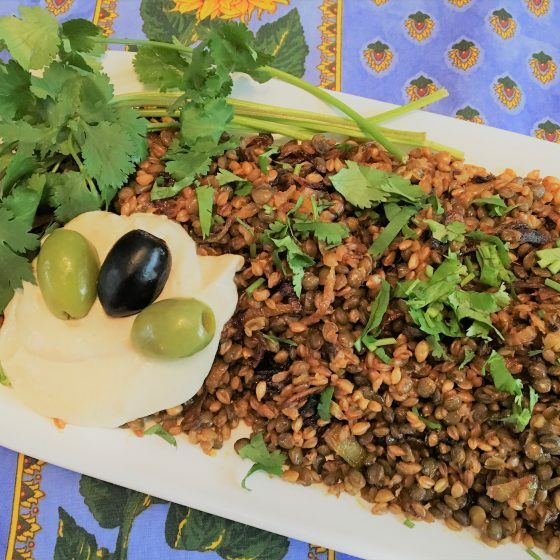 To serve: Toss together the warm cumin-scented Einka & Lentils, and the fried onions – be sure to use a rubber spatula to scrape out all the spiced oil! Taste and adjust the salt and pepper to your liking. Then top with any of the optional garnishes, and serve.